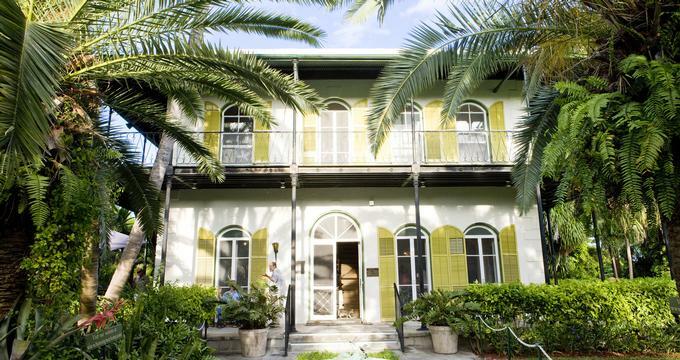 The Ernest Hemingway Home and Museum, located in Old Town Key West, is where one of America’s most beloved authors, Ernest Hemingway lived and worked for over a decade. Visitors can tour the Nobel Prize winning author’s home and gardens and visit with over 40 cats that call the property home. Ernest Hemingway and his wife, Pauline, moved to Key West, Florida, from Paris, France, in April of 1928. Ernest finished his novel “A Farewell to Arms,” in only three short weeks and the couple made friends with several Key West residents. After two years, the Ernest and his wife decided that they would make Key West their permanent home and Pauline’s uncle purchased a home for them on Whitehead Street in 1931 for $8,000 in back taxes that was owed to the city. The home had been originally built in 1851 by Asa Tift. The home was constructed from limestone rock that was native to Key West and hewn from the ground around the property. Asa Tift had 14 slaves that completed the construction of the home and the stone was hand cut since power tools were not invented at the time of construction. Electricity was not added to the home until 1899. The Spanish Colonial architecture was in very bad shape when the Hemingway’s moved in, but they undertook the massive restoration project and were able to turn the home into the National Landmark that it is today in just a few short years and $20,000, which was a great cost in the 1930’s Visitors can still see a penny that Hemmingway pressed into the drying concrete proclaiming that the construction was taking every penny that he had. Indoor plumbing was not added to the home until 1944 when Key West began piping in water from Florida City. One unique feature that the Hemingway’s had added to the property was the first inground pool to ever be installed in Key West and the only pool for over 100 miles. Much of the Hemingway’s personal effects are still located inside the property such as antique furnishing from their time spent in Europe, trophy mounts and animal skins from African safaris and big game hunting trips. The descendants of Ernest and Pauline’s unusual 6 toed tomcats still live on the property as well and still share the same unique 6 toe trait as their ancestors. Ernest and Pauline divorced in 1940 and Ernest moved to Cuba. Pauline lived in the home until 1951 when she passed away. After which Ernest left the house vacant and in the care of a grounds keeper, but used the home as a hotel on his trips between Cuba and the United States. In 1961, the Hemingway sons sold the estate to Bernice Dixon who moved into the rear of the home and opened the main home as a museum. When Dixon died in the 1980’s, her family continued operating the museum. The house itself is the main attraction of The Ernest Hemingway Home and Museum. The home is the largest property on Key West Island and attracts thousands of visitors every year. One of the most famous attractions of the home itself is the inground swimming pool which was planned by Ernest Hemingway but supervised by Pauline. The pool is 10 feet deep and 60 feet long, constructed on the site of the original Hemingway boxing ring where Ernest himself sparred with local amateur boxers in the early 1930’s including the famous Shine Forbes. The pool was a salt water system until the 1940’s when the home was converted to an indoor plumbing system and fresh water was piped in. The pool also had underwater lighting installed to give it a mystical and ethereal atmosphere that poet Elizabeth Bishop wrote about. The Hemingway home is surrounded by lush tropical gardens that are in bloom year-round with species such as Hibiscus, Lantana, Plumbago, Sea Grapes, Night Blooming Jasmine, and many other flora that are native to Key West and Florida. There are also several tropical tree groves from Banana trees to African Tulips, Barbados Cherry and Cabbage Palms. Visiting the Ernest Hemingway Home and Museum is a chance to learn about the one of the greatest American authors and his literary works as well as life in the early 20th century in Key West. 30 minute guided tours are available every day of the year with special group rates available for more than 12 people. The Book Store and Gift Shop gives visitors a chance to take home any one of Hemingway and a variety of other classic and well known author’s works, souvenirs and collectibles related to the writer or Key West.